Cast: John Travolta, Miley Cyrus, Susie Essman, Mark Walton, Malcolm McDowell, James Lipton. Story: Dog plays super-dog, doesn't realise he's just acting. Yes, I know it's a kids' movie - but wear a hat and dark glasses, no-one will know it's you. You'll be glad you did. The characters are superb, too. John Travolta's voicing of the little dog Bolt is fantastic - on a par with Jack Black's Kung Fu Panda - and the hamster-in-a-ball Rhino is hilarious. The story could be better - Bolt is a doggy actor in a TV series but doesn't realise it - he thinks his super powers are real but the TV crew just choreograph the action to fool him. It doesn't take long before you stop tutting about how daft that idea is and settle down to business, delighting in how real the dog's movements are, or how astonishing the fur effect is. There's none of the in-jokes for adults that we often see in movies like this, but don't let that put you off, as the movie's appeal transcends the age gap - everyone will come out smiling. 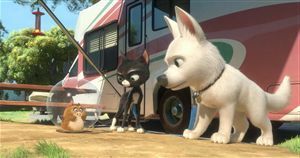 Bolt is yet another top drawer animation, and it's the first really good one from Disney. If I had to choose one from the past year, I'd still go for Kung Fu Panda, but I wouldn't argue with anyone who picked Bolt. You'll just have to see both. To enjoy this film: turn up. 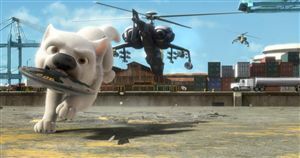 Bolt was released in the UK on 6th February 2009.